If you have young ones or are a new grandparent, I recommend picking this release up of Peter Pan today if you don’t already own it. It's no secret that Walt Disney had a passion for flying. He had his own private jets and tried to incorporate flying into his many of his animated films. Of course, this enthusiasm naturally lent itself to telling the story of J. M. Barrie's classic character, Peter Pan. As a boy living in Neverland and refusing to grow up, Peter Pan could fly and was the leader of the Lost Boys. He was mischievous and free-spirited and went on many adventures. Disney's animated classic, Peter Pan, came to theaters in 1953 but today it will be once again sold in stores for a whole new generation to enjoy as part of Disney's Anniversary Edition. I'm not sure if there is anyone out there who does not know the story of Peter Pan, but just in case here goes…Wendy (Kathryn Beaumont; Alice in Wonderland), John (Paul Collins; Executive Decision) and Michael (Tommy Luske; The Walt Disney Christmas Show) Darling are three British siblings who love make believe. Wendy, being the oldest, tells her younger brothers about Peter Pan (Bobby Driscoll; Treasure Island), a boy that never grew up and who lives in Neverland. He is the leader of the Lost Boys and his nemesis is Captain Hook (Hans Conried; The 5,000 Fingers of Dr. T). Mr. Darling gets annoyed with Wendy for telling her brothers these stories and filling their heads with "nonsense". One night Peter Pan shows up in the Darling's nursery with his pixie, Tinkerbell, looking for his shadow. He convinces Wendy and the boys to go with him to Neverland. Once there they face harrowing experiences with Captain Hook and Wendy has to contend with a jealous Tinkerbell who is doing her best to try and sabotage Wendy. Of course, like any good Disney tale, Peter, the Darlings and the lost boys prevail in the end. Peter asks Wendy to stay and "mother" the lost boys but the three return to the safety of their London flat with an adventure and a story to remember. The Anniversary Edition Blu-ray includes the Blu-ray, DVD, and Digital HD. The video is standard 1080p resolution with a 1.33 aspect ratio and mastered from the same negative as the previously released Diamond Edition. As with any Disney film, there is enough color to catch the eye without being overly obnoxious. The DTS-HD Master Audio 7.1 seems a little excessive considering the original movie was recorded in mono – the best technology of its time. Having said that the soundtrack is decent and clear. Stories from Walt's Office: Walt & Flight, A "Darling" Conversation with Wendy & John: Kathryn Beaumont and Paul Collins, "You Can Fly", and "Never Smile at a Crocodile"
DisneyView Sing-along Version of the film, Growing Up with Nine Old Men, Deleted Songs, Deleted Scenes, Disney Song Select, Audio Commentary Hosted by Roy Disney, Music and More, and Backstage Disney: You Can Fly: The Making of 'Peter Pan', In Walt's Words: "Why I Made 'Peter Pan', Tinkerbell: A Fairy's Tale, The Peter Pan That Almost Was, The "Peter Pan" Story. While not terribly long, at only 77 minutes, Peter Pan manages to spark the imagination of children everywhere – so much so that it is still one of the most popular rides at the Magic Kingdom in Orlando with wait times of up to 100 minutes. There is a whimsical feel to the story that children will love. And an added bonus is Tinkerbell is probably one of the first truly feminist Disney characters created which will delight little girls everywhere. If you have young ones or are a new grandparent, I recommend picking this release up today if you don't already own it. 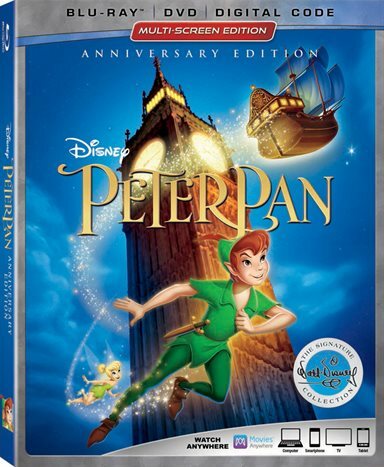 Download Peter Pan Anniversary Edition from the iTunes Store in Digial HD. For more information about Peter Pan visit the FlickDirect Movie Database.